This week’s Raw couldn’t quite live up to the week before in terms of excitement and action, however it was still another strong outing for WWE, with a number of strong matches and story development as we head towards Money in the Bank on July 14th. It was nice to see this story get spotlighted this week, as it opened and closed the show with both competitor looking very strong throughout. The show kicked off with Daniel Bryan in the ring, who cut an entertaining promo about little man syndrome before claiming he would defeat Randy Orton tonight, which lured Randy Orton out to the ring. The two quickly went at it and seemed like the match would take place then, only for it to spill to the out side, before referee Charles Robinson was knocked down in the melee and called for the double disqualification. It was decent start to Raw, and we got to see a taste of things to come later on, with Orton and Bryan’s dislike for each other really coming through well here. As we built up towards what would now become the main event of Raw, we got a number of backstage segments. Firstly we saw Bryan rage at Raw Managing Supervisor Vickie Guerrero and her assistant Brad Maddox, even challenging Brad to a match if he couldn’t get the match with Orton later. Vickie agreed until Mr. McMahon turned up, to talk about how Daniel Bryan was too small. Even though it was little frustrating to see the McMahon’s get involved in this feud, I actually quite liked this moment, as it seemed to come from a real place and we all know that Bryan doesn’t exactly fit Vince’s idea of a what a WWE superstar should look like. With Vickie contemplating cancelling the match Triple H turned up to give an opposite view and even offered the idea of holding a WWE App vote to choose the match type. It’s interesting to watch Vickie agree with whichever McMahon spoke to her last and I’d foresee a split between Vickie and Brad with each eventually siding with a respective McMahon. With all matches of this type, they’re made even better by good solid wrestling and a good story tell. This match had both in bucket loads, with a number of reversals including a nice powerbomb from Orton as Bryan jumped off the tope rope. The ending revolved around Bryan’s No Lock and the Singapore Cane, with Orton able to get out of the hold first time round with use of the cane, however second time round Bryan had to move scouted and used the cane against Orton to get the Submission victory, in what felt like an extremely satisfying ending to a great television main event. After the contest the two shook hands, although I hoping for a bit more development post-match, I can see why WWE went for this ending and hopefully we’ll get to keep seeing this side of Randy Orton over the coming weeks and months. Before the match took place we saw CM Punk backstage in a segment with Vickie Guerrero. Guerrero attempted to inform Punk that he would be in a match later on, The Best in the World ignored her before using Vickie’s “Excuse Me!” catchphrase against her and informing her that if she saw Heyman or Lesnar turned up that she should let him know. It was a nice segment between the two, even if it did slightly damped Punk’s appearance later on. Guerrero is someone who probably doesn’t get as much credit as she should for her job, considering she has no sought of training in any field, it’s been fantastic to watch her develop since her 2005 debut. She has to do very little to garner any heat from a crowd, although that has made it difficult for her to transition into a more likeable role as of late. Later on in the show, Paul Heyman came to ring and called out the Best in the World. What followed is difficult to fully describe, but we got a conversation between two of the best talkers professional wrestling has ever seen. The conversation they had revolved around Brock Lesnar’s attack on CM Punk last week and whether Paul Heyman was involved. Heyman of course denied any involvement blaming Punk and Lesnar’s respective egos on the attack. Heyman said it was up to Punk what he choose to do from then on, and after a long pause Punk apologised for doubting Heyman and the two embraced. The whole scene felt like something out some big budget US drama series with the hug at the end teasing that all was still not well within Camp Heyman. The match that Vickie mentioned earlier was against Darren Young of The Prime Time Players. The match was a lot more competitive than I had expected with Young getting a fair amount of offence in on Punk, even hitting his Gut Check finisher for a two count. Punk eventually got the win after a Roundhouse kick followed by an Anaconda Vise for the submission victory. Young’s Prime Time Player’s partner, Titus O’Neil then entered the ring and the two began to beat down Punk, until Heyman’s other client Intercontinental Champion Curtis Axel made the save, much to the displeasure of Punk. It’s interesting to see WWE playing around with the concept of what makes a heel and a face as of late, with this storyline and Orton and Bryan being some of the most interesting television WWE has put on in a long time. Later on backstage we caught up with Punk and Heyman, with the Voice of the Voiceless not particularly happy with his best friend’s actions, he was even less happy to find out that he’d be teaming with Curtis Axel next week against The Prime Time Players. Punk cut a promo on his goals for the future, including beating Brock Lesnar, winning Money in the Bank and the WWE Championship. This feud involving Lesnar, Heyman and Punk (and to some extent Curtis Axel) feels like it could run and run, with a lot of avenues that could be explored and an eventual Punk-Lesnar contest (or even series) being a mouth-watering prospect for true wrestling fans. After the fresh feel to feud between these two last week, it felt like business as usual this week on Raw. It seems that every single feud we’ve seen from Cena at one point has featured these duelling promo type segments. We saw it recently with Ryback, we’ve seen it with The Rock as well. I expect the week before Money in the Bank we’ll see the Cena and Henry “face to face” segment make a return also. It’s a shame because this could rivalry really could’ve helped to freshen up Cena’s act as well as give the match a lot more importance come Money in the Bank. A regular match between Cena and Henry will be nothing special, a match with heaps of story and background could be extremely entertaining. Cena’s promos as of late have been pretty poor, and that’s not just by Cena’s high standards, that’s in general. It used to be that the current WWE Champions promos were one of the strongest parts of his game, however this week like last he seemed to phone it in once again. It was basic cookie cutter Cena promo, as he spouted his Never Give Up, RTime=Now catchphrases and it didn’t particularly put over Mark Henry as all Cena wanted to talk about was himself. It’s definitely time to add some dimension to Cena’s character, I’m not talking about the myth of a heel turn, just some level to the character, have him talk to the audience for once, not shout at them! Mark Henry on the other hand delivered a much better effort, talking about how he got the fans last with his faux retirement speech. He talked to the fans, making fun of them and really should have got more heat than he did, if it weren’t for a crowd that was dead for most of the night. The World’s Strongest Man manages to use humour in his promo that is actually funny, whilst staying within the parameters of being a heel, which definitely brings that extra dimension that all wrestler characters should have. Henry finished off by proclaiming he would win the WWE Championship at Money in the Bank, it was a nice follow up to last week’s segment and built up the match at the PPV well. The positioning of the segments on the show certainly felt like WWE taking their foot of the gas for this rivalry, compared to last week. It didn’t quite feel as big as last week’s segment and a lot of other segments on the show felt more important than what we saw here. If this match is to main event the Money in the Bank show, which it could do if handled well enough over the next two weeks then we need to see it in a much more prominent position on WWE television, other wise what could be a good feud is going to get lost in the mix. In other action, there was a rematch from last Friday’s Smackdown pitting World Heavyweight Champion Alberto Del Rio against Chris Jericho. It was another strong contest between the two, even if it was similar to their original Smackdown contest. Del Rio worked over Jericho a lot of the contest, with a number of short lived comebacks from Jericho. With Y2J dodging Del Rio sending him into the ring post, the match really got going with some nice back and forth wrestling between the two, focussed on the pairs submission finishers. With Jericho getting Del Rio into the Walls of Jericho in the centre of ring, Ricardo Rodriguez had to inference with his trusty bucket to give Jericho a disqualification win. These two could have a great contest if given the time and a decent storyline, as well a clean finish, but for now I guess this match is more than good enough for Raw. It wasn’t long before Dolph Ziggler came out to take on Del Rio, hitting him with a Zig Zag, whilst Jericho took out Rodriguez with a Codebreaker. With Ziggler and Jericho squaring up, supposedly over Jericho’s Code Breaker to Ziggler on Smackdown, it was Ziggler who attacked this time, hitting Jericho with a Zig Zag as he tried to leave the ring. I’m not sure why Jericho was added to this rivalry in such a way, it really didn’t need him to get involve to fuel it, whilst Ziggler attacking Jericho certainly won’t help his recent face turn get over with certain parts of the audience. Stephanie McMahon was also involved on television this week, firstly in a backstage segment with Vickie Guerrero. McMahon was quick to show who was boss and questioned why Vickie hadn’t announced who was in the WWE Championship Money in the Bank Ladder Match, after they had previously spoke about it, referencing a conversation seen of screen is never fun as a viewer, imagine the same happening in Coronation Street and it could get very confusing. Personally any relevant information for the storyline should be seen on screen, if it isn’t seen it shouldn’t be mentioned, bar the occasional addition of background on characters. Stephanie then went out into the arena to announce who would be taking part in this years WWE Championship Money in the Bank Ladder Match. The participants would be CM Punk, Daniel Bryan, Randy Orton, Sheamus, Christian, Kane and Rob Van Dam. This match sticks to idea featured in last years match of having former WWE or World Heavyweight Champions in the match, with only Daniel Bryan and Christian yet to win the WWE Championship. Some may moan that the Money in the Bank should be used to raise the profile of other talent, however personally I am not too bothered by the selection here and with a good storyline in place anyone should be able to win the briefcase regardless of past achievements. There’s a lot of different stories going into this one match and it will be interesting to see how they mess together to create the contest. There was also Diva’s action with Kaitlyn (who for some reason was accompanied by Layla) taking on Aksana. Luckily, the match didn’t go very long before it was interrupted by AJ Lee, dressed as Kaitlyn complete with muscle suit. AJ cut a promo as Kaitlyn, in a segment reminiscent of the Piggy James angle from 2010. It finished with Big E coming out with flowers and carrying AJ away, it’s nice to see WWE hasn’t forgotten what happened a few weeks ago and this was done well, and with a lot more taste than Piggy James was. With Aksana trying to take advantage of the situation, Kaitlyn quickly fought her off hitting a spear for a victory. It’s simply good to see such a heated, dimensional rivalry between the Diva’s that is still grabbing my attention this far in, even if Layla does seem a bit of a spare wheel. The Shield got a new contender to their championship as The Usos picked up a win in a Number One Contenders Three Way against Tons of Funk and 3MB’s Drew McIntyre and Jinder Mahal. It was decent quick match, which featured a nice spot with Brodus Clay diving off the apron, but it was clear who was going to win from the outset with The Uso’s being the only team in the match having anything resembling a push as off late, and it could even be questioned why Tons of Funk or 3MB deserved to be involved in a number one contenders match. After the match, The Shield came out but simply stayed in the crowd and pointed at The Usos, in what was a disappointing start to the rivalry. Ryback was also in action this week against The Great Khali, in match that was set to delight wrestling purists. In all honesty, it was an abysmal match, with it’s saving grace being how quickly it was over and the impressive visual seeing Ryback deliver Shellshocked to Khali. After the contest Ryback went to Vickie Guerrero to demand he be added to the WWE Championship Match at Money in the Bank, whilst Chris Jericho also turned up asking to be added to the Money in the Bank Ladder Match. Eventually, Vickie decided to put them in a match with each other at Money in the Bank instead. 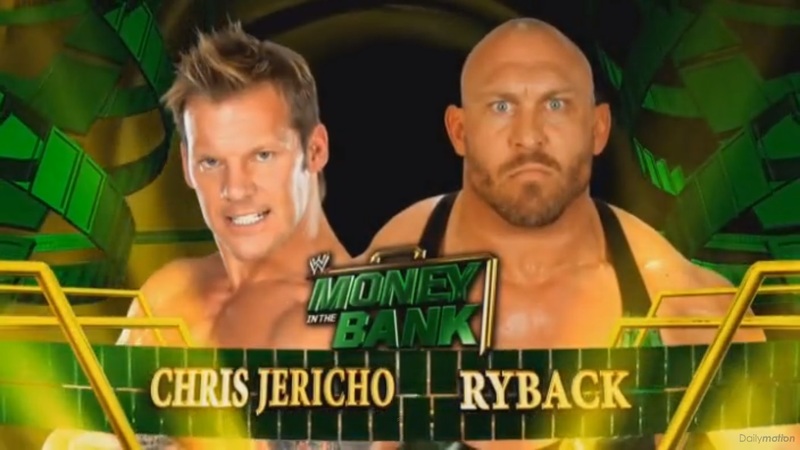 I’m not sure how good this match will be, but if anyone can make Ryback look a million dollars, it’s Chris Jericho. The Sheamus/Damien Sandow feud continued with Sheamus teaming with Christian to take on Team Rhodes Scholars. The majority of the match was worked by Christian and Cody Rhodes, who did a decent job with the time they were given in the ring, Christian sold especially well meaning the hot tag to Sheamus felt more important than it really should have. Sheamus took out both Rhodes Scholars before eventually hitting a Brogue Kick on Rhodes for the victory. It was an okay tag team match, but nothing particularly out of the ordinary. It would look like the Sheamus/Sandow rivalry is set to finish on Smackdown with the two having a Dublin Street Fight. Vickie Guerrero, Brad Maddox and Jerry Lawler also revealed the cover for the new WWE 2K14 video game in what was a pretty poor segment. The idea of a create your cover competition was put over with covers from Guerrero and Maddox, in a segment that really should have been over quickly to simply show the cover and promote the game. The cover itself features The Rock, and personally looks like a fairly uninspiring cover. What have we learned from this week's Raw? 1. A street fight must finish within the ring, who'd have thunk it. 2. CM Punk and Paul Heyman of as much genius opposing each other as they were as partners. 3. The WWE App references slowing down, make the times it is referenced more significant, making me more likely to use the App!